Late into the night, after the first flush of events of a long weekend of performances in Chinatown for the annual Perform Now! festival, a small crowd lounged on the back patio of Human Resources, sipping the cool, fruity dregs of a welcomed sangria. Two musicians, Emily Lacy and an accompanying violist, Ezra Buchla (formerly of 'Gowns' and 'The Mae Shi') warmed up for a final set to the spare audience. Leaning back to hear the creak of the metal of my folding chair, I sat with my hands nervously fidgeting, as they will, cigarette or not, and listened to the unearthly music. The lights strung along the metal canopy of the back patio illuminated the urban half-darkness with a soft glow, a kind of orientalist intimacy for old Chinatown. In the end of a night quietude, of many nights even perhaps all lined up before it, Lacy played us some strange and beautiful music, softly singing into her microphone and twiddling with knobs in what seemed an infinite playback of her ethereal voice. Hunched over on the ground, she clanked like a cowbell her mic stand whilst the violist intermittently plucked and bowed his strings, pitched and mournful as only a violin can be. The music of country balladeers in the Elysian Fields in the afterglow of a mildly apocalyptic future, the dogged hum of space cowgirls long after the range went galactic, (way past folk gone electric), the music dreams the dream of all the places I want to end up in the end of the long day’s journey into night and never really do. Human Resources had a handful of its sundry proprietors lounging along as well, Devin McNulty and Eric Kim, if my memory serves right were in the crowd of no more than fifteen people. These two, and their collaborators which include Kathleen Kim, Giles Miller, and Dawn Kasper (perhaps more) have put into this back gallery patio something I’ve rarely found in my travels and travails in the Los Angeles night, a community. One that neither drops into some hipster haven with all the trappings of those chasing the tail of a receding comet, nor an elitest club of exclusionaries, moneyed, listed, and invited. Here was something simpler and rather magical. This was just one of a series of events for the weekend, and such events are often common at Human Resources, the only performance venue of its kind in Los Angeles. 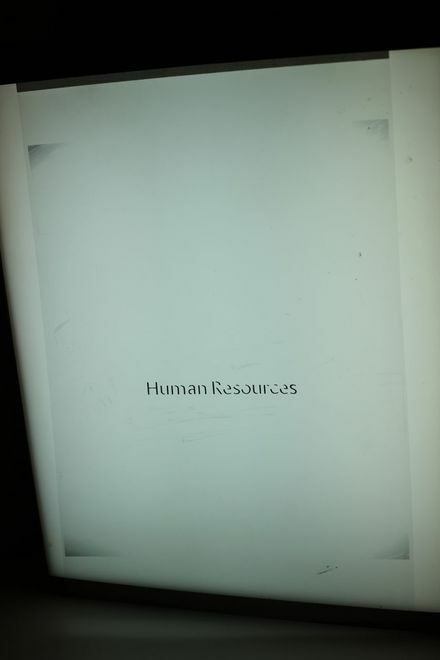 Neither a wheezing dinosaur nor a fully refined stab at late-capitalist avant garde, Human Resources isn’t alone in its general venture, but perhaps unique in its approach. Over the last years there have been a number of spaces around LA's eastside with a commitment to performance and unusual music, many of which I've found in Echo Park, from Pehrspace to Tiny Creatures to Echo Curio to that rather wonderful upstairs space next to the Echo (who’s name I never knew, but only figured to go on the end of its residency there) to countless strange apartment and warehouse parties around downtown and its environs. What makes Human Resources interesting to me is not only its idealistically and likely unsustainably non-commercial spirit. More than that I am attracted to it's ability to connect disparate groups, pushing what could be called a "performance art" or an "alternative music” venue into an uncodified space for the gathering of divergent activities and people. Exploring the experimental music scene, performance art and visual art scene, this space brings together a handful of eastsiders interested in art and indie music with some of the traditional players in the art world looking for something new. And all of this takes place in what had been one, and then another, commerical gallery for much of its recent history (David Kordansky Gallery for some years before briefly hosting Parker Jones, both have since sortied to Culver City). The connection to the art world is a real one. Though it may lack the polished concrete and square footage of other art districts around the city, Chinatown has been for some time a place for young galleries to make their way (even if the last year or two has seen quite a few close up or move on). The gallery projects at Human Resources have been pretty lackluster so far, in my opinion, but still better than most other music venues with galleries around town. And though not strong, fairly serious in their attempts. Though the art in the gallery always felt a little auxiliary to the music and performances at Human Resources, such as the late night set with Emily Lacy, nevertheless the few I’ve seen have tended to be pretty special, if not at very least memorable. Human Resources seems the strongest incarnation yet of a cultural scene that's been developing for a while, but never fully been able (or perhaps interested) in crossing over and attempting to have some kind of serious conversation with the mainstream of contemporary art in the city. In this moment, LA really needs someone to stick their neck out for non-commercial, alternative ventures outside of the two models (non-profit and for-profit dichotomy). Furthermore, it's the palpable feel of the place, there in its various trappings, a sense, however silly it might sound, of feeling like you've ended up in the right place, somewhat friendlier and more experimental than anything else around. It feels in some ways like a lab for a whole bunch of other people (hopefully) to start things themselves. In a time for LA when the institutions seem to be largely (but not entirely mind you) failing us, it felt like we needed something that brought new energy into art but without the strictures of the old ways of doing things. Those old models are likely to stick with us for some time, if only because its probable that Human Resources is a work of love rather than of money, and its hard to sustain something like that for too long. But nor perhaps should it last for too long (though I hope it stays open for quite some time yet). These places are meant to be evanescent, fiercely and firmly doing what can be done for as long as it can be done before the hardening of structure and orthodoxy turn it into an aimless bureaucracy, beaten down by either incompetent leadership or insular politics like too many non-profits around the city. I hope Human Resources can continue for a long time, or at least long enough to inspire a half-dozen cultural spaces to open up their own attempt at shifting culture, creating in the trafficed solitude of Los Angeles, a place to gather.